Simon & Schuster Books for Young Readers, 9781481472678, 416pp. S.J. Kincaid is the New York Times bestselling author of The Diabolic. She originally wanted to be an astronaut, but a dearth of mathematical skills made her turn her interest to science fiction instead. Her debut novel, Insignia, was shortlisted for the Waterstones Children’s Book Prize. Its sequels, Vortex and Catalyst, have received starred reviews from Kirkus Reviews and Booklist. She’s chronically restless and has lived in California, Alabama, New Hampshire, Oregon, Illinois, and Scotland with no signs of staying in one place anytime soon. "Exploring what it is to question society’s definition of what you are and who you should be...the first-person narration makes the story immediate, and the political plotline could yield some thought-provoking discussion." "Kincaid has crafted incredible characters who readers can relate to and care for...these protagonists and the complex setting will thrill the YA audience. VERDICT Fans of Marissa Meyer’s “The Lunar Chronicles” will enjoy Kincaid’s latest. This story of friendship, love, loss, suspense, and galactic beings will grab the attention of sci-fi fans and general readers alike." "Sings with intrigue...With unpredictable twists and mounting suspense, The Diabolic is a breathless journey into the very center of what it means to be human"
"You start loving Kincaid's second science fiction novel on Page 2...Watching Nemesis cut a violent swath through the vile, duplicitous aristocracy is a joy...the tension is nearly always high, the characters memorable, and the bond between Nemesis and· Sidonia genuinely moving. "Diabolic," itself a genetic experiment blending "I, Claudius" and "The Terminator," appeals to both our better and more devious angels." 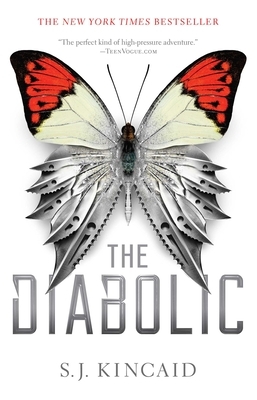 "The Diabolic is a solid young adult sci-fi adventure that is sure to appeal to the masses...Highly recommended for high school readers and collections." "The perfect kind of high-pressure adventure"
"The world building is excellent...readers will soak in the nuances of this complex post-Earth society"
"Readers who love a good dystopian plot with violence, twists, and romance will enjoy this novel."